In order to be able to utilise the graphic features of new PC generations, including DirectX, BECKHOFF Automation redesigned the Scope software for the TwinCAT automation suite. The new configuration, graphics and functional extensions offer a basis for measuring tasks. The new TwinCAT Scope is equipped for Scientific Automation. It features a separate Logger and Viewer. The Logger, which can also be installed in a Windows CE control system, records the data from different channels with time stamps and saves them intermediately. The data can come from different PCs and different software devices, including PLC and Motion Control. The Viewer retrieves and displays the data from the Logger by means of ADS. The configuration of the TwinCAT Scope is also carried out in the Viewer. An assistant supports the search for variables to be recorded. Following selection of the controller, it is possible to browse inside the corresponding PLC. Various defined interfaces are already integrated, e.g. for alternative axes (logarithmic) or special output formats (Microsoft Excel). The data can be processed before they are graphically displayed, e.g. through a Fourier transformation. 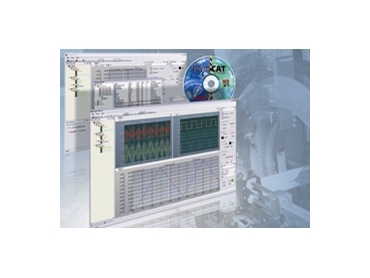 Scientific Automation from Beckhoff includes integration of additional functions in the software PLC. In addition to sequential control, motion control and control technology, the software PLC also includes measurement technology and other components. PC Control technology with CPUs offers a platform. The new TwinCAT Scope is part of the Beckhoff Scientific Automation initiative.